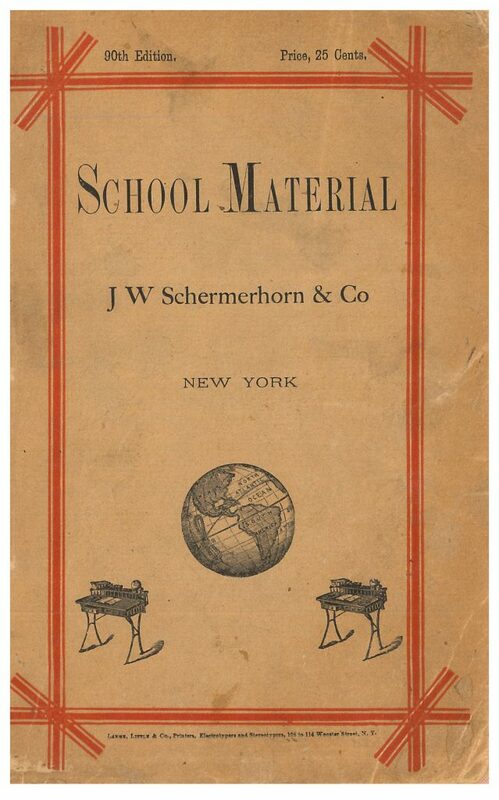 The catalog is by J. W. Schermerhorn & Co. and is entitled Illustrated, Descriptive Manual of School Material for the Use of All Whom It May Concern (1874). J. W. Schermerhorn & Co., New York, NY. Illustrated, Descriptive Manual of School Material for the Use of All Whom It May Concern, 1874, front cover. J. W. Schermerhorn & Co., New York, NY. 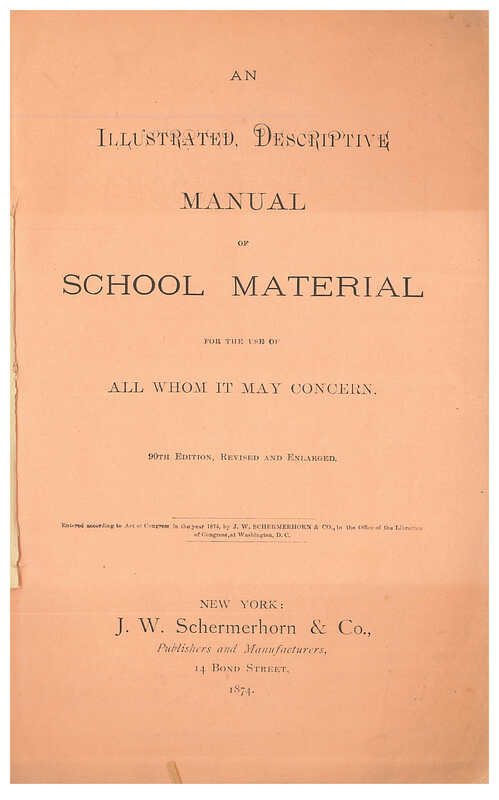 Illustrated, Descriptive Manual of School Material for the Use of All Whom It May Concern, 1874, title page. We all probably expect to see desks and chairs in a classroom. But what about items used to teach the lessons? What would they have used in 1874? Here are some teaching aids from the catalog, including ones with an object or picture based focus. Illustrated below is Jeffers’ Panoramic Apparatus. 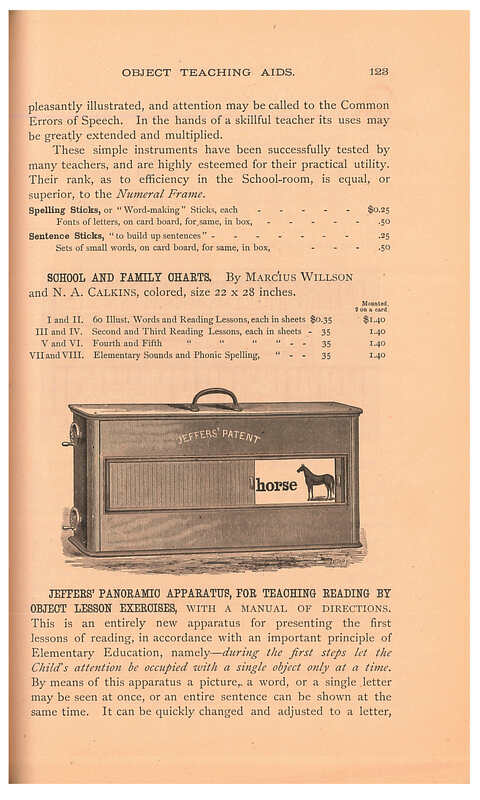 The catalog describes it as an aid used for “teaching reading by object lesson exercises.” The catalog mentions it was based on a principle that a child could learn in the beginning by focusing his or her attention on a single object at a time. The apparatus displayed a picture, word, single letter, or entire sentence. Alongside a picture was a word to help the student learn the word by seeing a picture of it. The example below shows the word “horse” written alongside a picture of a horse. J. W. Schermerhorn & Co., New York, NY. Illustrated, Descriptive Manual of School Material for the Use of All Whom It May Concern, 1874, page 123, Jeffers’ Panoramic Apparatus. J. W. Schermerhorn & Co., New York, NY. Illustrated, Descriptive Manual of School Material for the Use of All Whom It May Concern, 1874, page 124, Spelling Case. Another teaching aid, illustrated above, is the Spelling Case. It allowed children to move wooden blocks of letters around on a board to form words. The students learned to spell by physically doing an activity. The students could not remove the blocks from the case, but, instead, the blocks rested in grooves and followed the paths of the grooves, sideways or up and down, to form words or sentences. 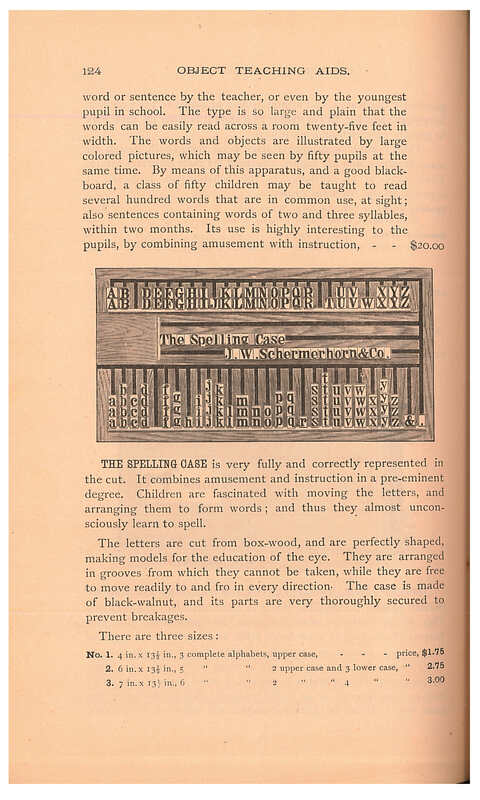 Illustrated, Descriptive Manual of School Material for the Use of All Whom It May Concern (1874) by J. W. Schermerhorn & Co. includes other teaching aids for lessons on sound, color, weight, numbers, geography, and more. This catalog is available in the Trade Literature Collection at the National Museum of American History Library.